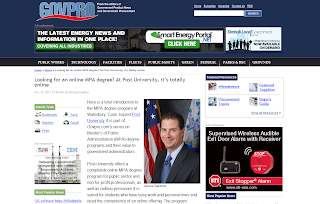 Our Master of Public Administration (MPA) Degree Program caught the attention of Govpro’s Michael Keating recently. He asked me several important questions about how it’s structured, including why we integrate courses from our MBA program to help students improve their executive administration skills. Michael also interviewed me about whether 2012 is a good time for government administrators to earn an MPA, and my advice for choosing an MPA program. He featured my perspectives in an article on Govpro. Take a look and let me know what you think. Feel free to ask any questions you have about getting an MPA degree — whether from Post University or in general — in the comments section. Thanks again, Michael, for featuring my thoughts.